This report provides an updated review of sputtering technologies and a description of various types of sputtering targets and their fabrication methods and identifies current and emerging applications for these technologies. BCC Research delineates the current market status for sputtering targets, defines trends, and presents growth forecasts for the next five years. The sputtering target market is analyzed based on the following segments: application, material type, and region. In addition, technological issues, including key events and the latest developments, are discussed. In the first section, an introduction to the topic and a historical review of the sputtering process are provided, including an outline of recent events. In this section, an overview of the latest technological developments related to sputtering technology is supplied, and current and emerging applications for sputtering are also identified and grouped in segments (electronics, optoelectronics, energy, optical coatings, mechanical/chemical, life sciences, sensors and instrumentation, and others). The second section provides a technological review of sputtering targets. This section offers a revised and detailed description of sputtering target types, traditional and emerging target materials, as well as typical fabrication methods and recent process updates. Each of these three sections concludes with an analysis of the most important technological developments since 2016, including examples of significant patents recently issued or applied. The chapter ends with a highlight of the most active research organizations operating in this field and their activities. 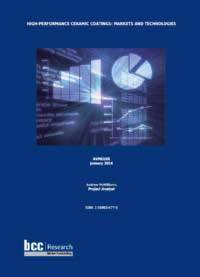 The third section entails a global market analysis of sputtering targets and sputtered films. Global revenues (sales data in millions of dollars) are presented for each segment (application, material type, and region), with actual data referring to the years 2016 and 2017, and estimates for 2018. Dollar figures refer to sales of sputtering targets at the manufacturing level. Consumption of sputtered films and target material is also offered for the years 2016 through 2018 and compounded annual growth rates (CAGRs) for these market indicators for the same period are calculated. The analysis of current revenues is followed by a detailed presentation of market growth trends, based on industry growth, technological trends, and regional trends. The third section concludes by providing projected sputtering target revenues and total sputtered film areas within each segment, together with CAGRs for the period 2018 through 2023. Projected and forecast revenue values are in constant U.S. dollars, unadjusted for inflation. In the fourth section of the study, which covers global industry structure, the report offers a list of the leading suppliers of sputtering targets, together with a description of their products. The analysis includes a description of the geographical distribution of these firms and an evaluation of other key industry players. Detailed company profiles of the top players are also provided. The fifth and final section includes an analysis of recently issued U.S. patents, with a summary of patents related to sputtering target materials, types, fabrication methods, and applications. Patent analysis is performed by region, country, assignee, patent category, application, and material type.